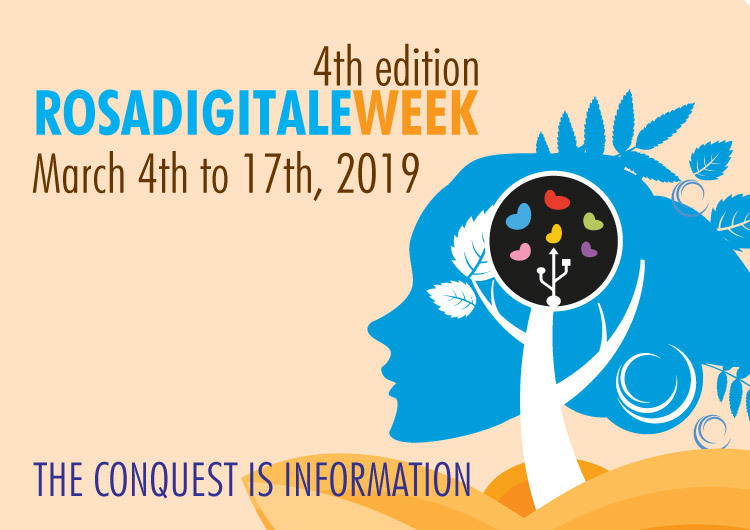 Throughout Italy and internationally, from the 4th to 17th March 2019, the fourth edition of Rosadigitale week will take place on the occasion of the International Women’s Day. Organized by Rosadigitale, a national non-profit movement for gender equal opportunities in the technological field, it is an event born as an initiatory journey towards gender equality in all sectors of technology. The initiative, which in March 2018, boasted more than 1,070 events spread throughout Italy and in some foreign countries, including: USA, Turkey, Serbia, Bulgaria and Spain and saw the participation of special guest Lynn Johnson, American National Geographic photographer, with an aim to make parents, seniors, boys, women, men, children, teachers and entrepreneurs aware of equal gender opportunities through information, as the movement’s motto says: “The conquest is information “. There will be days of reflection in which we will remember the social achievements of the great women who have contributed and others who are still actively co-operating and contributing with society in making it more innovative, but also days full of informative and practical events, live and online, covering topics of all technology sectors, such as: programming, web marketing, robotics, electronics, graphic and web design, online journalism, digital painting, digital photography and many others. Don’t put limits on your future … take part in the events that will be organized! How will the Week take place? Associations, institutions, organizations, foundations, people, companies of every technological sector, educational institutions of all levels and universities that will collaborate with Rosadigitale, will independently organize events, called petals, in every Italian region and foreign country. The events, preferably free of charge, can be of different types: projects, workshops, talks, seminars, workshops, online and / or live courses and it is advisable that they be aimed at everyone, regardless of gender. Put yourself and your creativity in the game to bring down inequalities … Make your event happens! Each Region or foreign country will have two representatives, one male and one female and collaborators as a symbol of gender equal opportunities. What is the role of the representatives and collaborators? The representatives represent the Rosadigitale movement in their region or foreign country. If they think it is necessary, they can coordinate with the collaborators of their own Region or foreign country who intend to collaborate with them and not those who decide to make their own contribution by choice. It is preferable that there is synergy between the representatives and collaborators. if the agents want to create: a petal or more events, an article, video, materials or images concerning the initiative or the petals, they are free to do so. Color your country with petals … become a representative or collaborator! You can send your application up to and no later than January 31, 2019. Another important role are the media partners that support the initiative by divulging it. What is the task of media partners? contact journalistic publications, blogs, radio or TV that can divulge the event. Open people’s eyes through information … become a media partner! Boys are immediately introduced to technology through: tablets, smartphones, PCs. On the other hand, there are little girls, who receive dolls, princess crowns, kitchens, and pots. Children should have the right to experiment with both “female” and “male” games. Women often get paid less than men in companies. It is clear that equality is still far away. There are various prejudices and stereotypes created by society that have made the female population move away from technology and, consequently, from an increasingly technological future. Rosadigitale will be the union of all regions, nations and foreign countries that with their petals will launch a challenge for equal opportunities, joining together to bring down the gender gap in the digital world. Rosedigitali will also be women and men, immersed and wrapped in a week where the innumerable petals will be a fundamental part of the initiative. Every rose has its thorns, in this case the inequalities, but it also has its petals: conquests that will spread, forming a carpet that will accompany women and men to the battlefield. Follow us on social networks for all the updates!